Home » SEO blog » Facebook » Is Facebook getting less important? Is Facebook getting less important? Nowadays, the majority of teens use YouTube and Instagram, instead of Facebook. And, websites are now attracting more traffic from Google – organic search – than from Facebook. Statistics aren’t looking that good for Facebook. Is Facebook getting less important for companies, blogs, and websites? And what should you do about it? In this post, I’ll bring you up to speed on all the latest Facebook trends and help you to figure out how to act on it. Want Before we dive in, if you want to learn more about social media and other essential SEO skills, you should check out our All-Around SEO training! It doesn’t just tell you about SEO: it makes sure you know how to put these skills into actual practice! According to the statistics of Pew Research, teenagers use YouTube, Instagram, and Snapchat, while only half of the U.S. teens have a Facebook account. And only 10 percent of the teenagers say that Facebook is the social medium that they use most often. This in contrast to three years ago, when Facebook was the dominant social media for U.S. teenagers. Social media use of teenagers has changed rapidly, and not in favor of Facebook. 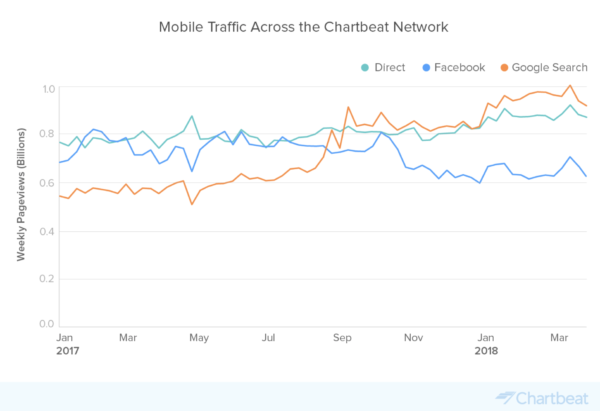 According to Chartbeat, direct mobile traffic and traffic from Google search are now more important than referrals from Facebook on mobile devices. For some time, Facebook was the most important source of traffic. For publishers, bloggers and website owners, it was critical to be active on Facebook. However, nowadays, Google search, a.k.a. organic traffic seems to become even more significant (on mobile devices). Focussing on SEO is (now more than ever) a critical part of your strategy! Facebook is still essential, and nobody knows how these trends will evolve. In a previous post, I wrote about Facebook’s algorithm; I already suggested a few ways to increase your traffic from Facebook. I think there are a lot of ways that’ll allow you to keep getting traffic from Facebook. That said, you cannot focus solely on Facebook to get that traffic to your website. That’s why I will suggest some other alternative strategies you should check out. Do you already have Instagram and Snapchat accounts? Instagram is rather straightforward: lots of pictures, short movies, and photos. Snapchat is a bit harder and the opportunities for companies are less obvious. Perhaps you think that Instagram and Snapchat just don’t fit your business. And maybe you’re right. However, an entire generation is growing up using these tools. So, I think you should at least claim an account and get started. You can always ask your 14-year-old nephew to help you out. My twelve-year-old is almost physically attached to YouTube. He uses it as often as I use Google. He doesn’t understand why you would ever read texts when you can also watch videos. To appeal to a younger audience, creating video’s will probably be a really wise move. If your content allows for it, making video’s and optimizing these for YouTube could be a great way to attract an audience to your site. Investing in video is hard. It may even be harder than writing content. It can also be slightly awkward to stand in front of a camera at first. Once you get the hang of it, it can also be good fun! Last week, Techcrunch reported that stories are about to surpass feed sharing. A lot of social media platforms have incorporated stories in their features. It all began with Snapchat, but now you can share stories in WhatsApp, Facebook, and Instagram too. Even the AMP project now has stories for the web. People are sharing their stories and watching the stories of others, even those of media companies. Stories require a different approach than standard post for social. And the engagement with posts (for instance comments) is entirely different. But stories also give an excellent opportunity to create new innovative content. I think, focussing on stories and trying to use stories for your business could be a fantastic strategy. Facebook seems to generate less traffic, but it appears that ads on Facebook are still doing well. 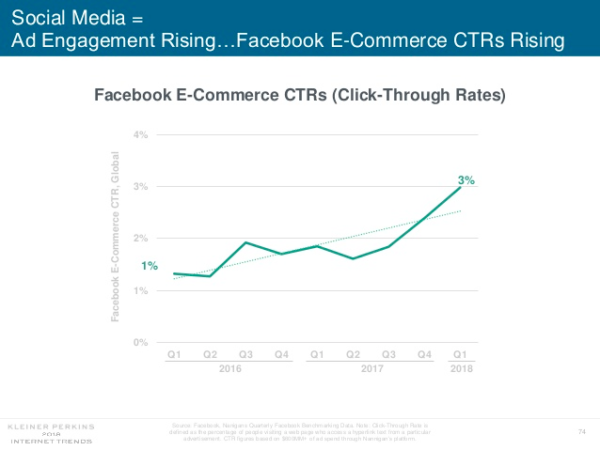 According to the latest internet trends report by Mary Meeker, the click-through rate of ads on Facebook has almost tripled since 2016. Advertising on Facebook isn’t all that expensive, and you can target your audience reasonably well. If you haven’t already, this is a strategy you should try out. Social media should always play an important role in your online strategy. But, focussing on your website: making sure that it has original and well-written content, that it’s fast and provides the best user experience, should be your priority. If your website has all these features, then you’ll attract traffic, from Google and other sources! 56 Responses to Is Facebook getting less important? Thanks for sharing this information. But Facebook is still a good platform for getting more traffic. Marieke, tehe stats you indicate are mostly reffered to yound adults. What about people over 35yrs old? Do these stats apply to adult market as well? Good points Marieke. Totally agree that you cannot focus solely on Facebook to get traffic to your website but it’s still helpful, especially if you focus your attention on FB groups and FB Live/video which is seeing better organic reach than FB pages currently. Of course this all starts with ensuring your content is actually helpful and share-worthy! Also worth mentioning the importance of re-purposing content for different social platforms. I recently published a guide to re-purposing content for anyone interested. Nice blog dear. But still Facebook is a big platform for your traffic, here the visitors are coming genuinely. Great article after reading this article I asked my niece in high school if she uses FB and she replied that it’s not that important to her. I think using FB is still a great source of targeting, as SEO our targeted audience shouldn’t be teenagers anyways. I always recommend FB ads with quality content as one strategy for conversions, but I focus my organic traffic increase off SEO. Thanks for sharing this. Thanks for the article, I have noticed that Pinterest performs better than google and Facebook is getting down for bloggers. Hello friends, your article is very good. I want to ask you a question; My site has a lot of traffic from Facebook. But in Search console I do not have any link to my site. How should i do? or it will be that google is not showing the links for some special reason. Since I was very grateful for his answer and I apologize since I do not speak English and I did with the Google translator. I must say that I was on Instragam for my business for a few months but found it rather useless. 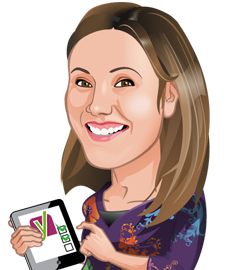 It’s a great tool for the business that is very visual but the issue is then getting that picture to turn into website clicks – which just doesn’t happen in astounding amounts (at least not for me). Facebook accounts for only 6% of my traffic and considering how much work it is to maintain I’m only giving it to the end of the year to make a difference. Deciding where to set up an account to me is about considering your brand and key audience. For the most part I’m focusing on SEO on my website. Thanks for sharing but for me Instagram and Facebook both are same for me. I want to confirm the idea that Facebook is getting less and less important and losing its dominance, We used to invest our time on Facebook but we’ve switched our primary effort on our Instagram presence lately. The only advantage of Facebook is that you can publish text content easier that Instagram and Facebook is more suitable for text content. Yes absolutely right, Instagram, Pinterest, and Youtube are dominating the market there is no doubt, thanks for sharing! No doubt Facebook’s reach is decreasing but not all of us have 14 year old’s as our target market. Facebook is still the most popular SM product for older demographics and not all of us love video either. The real bottom line is to keep producing quality content. The better your content, the better your results. We all have to change and test. I do see a reduction in quality fb leads. I even watched part of a video on YouTube that declared the channel was hosted in Russia and was known for fake and misleading content. The world is changing and we must change with it. Hi David! For sure investing in quality content is never a waste of time, whatever platform you use. The Only best way left with us is to do marketing via E-Mail Marketing. It is completely under our control. Thanks for the article. The statistics clearly point out that traffic from Facebook is lower than the regular organic search. However, the choice of social media channel also depends on the demographics the brand is looking at and as rightly pointed out, the cost factor. My opinion is, millennials still are heavily Facebook savvy, and find moving to Instagram and Snapchat a little difficult, if not irrelevant. So, if brands are looking at younger demographics, certainly they should focus on the new channels. If not, Facebook still holds good in engaging the desired audience & in developing a strong brand following, at a reasonable marketing spend. you’re totally right. In order to truly make sense of it all, you should check out the demographics. The study of pew research actually does that. I just decided not to go in to much on that aspect in this post. Sadly I have to agree and I do see the trend on my FB page with approx 15.000 fans. Even highly relevant organic posts only have a reach of about 500 users. A year ago I could easily reach 2000 users with a single organic post. may be you are right but facebook is still more important in getting traffic instantly and it is also depends on the nature of your site. totally right! For some sites and for some demographics Facebook will remain of great importance. 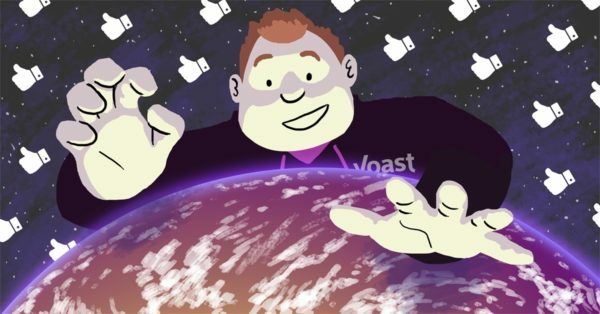 At Yoast, we still invest in Facebook as well! Great stats and tips. I do agree 100% with starting to look more at Instagram and other platforms but demographics also still play a key role in selecting which medium to focus on. If your business targets teens (iGen) as customers, then Instagram is probably the default choice. But the millennials are still mostly on Facebook so this should be something to consider before taking a dive and investing time into the other platforms. Great post. I can’t remember where, but I once heard the following in a Podcast (years ago when al the fuzz about Facebook/Live); “never let other trends fully distract you from the main goal – to ultimately drive traffic back to your main hub ‘your website’ “. But I see now why that approach had and still has significant meaning… al these platforms can come and go, but your business, your site everything you’ve built will always be there ‘working for you’. Marieke van de Rakt, great point. We have been discussing this at US Logo. My son, who is 13, does not use Facebook anymore. He uses Snap Chat to communicate with all his friends. Even the younger adults, 25-35 years of age, that I know are using Snap Chat and Instagram instead of Facebook. These facts have led us to explore marketing on Snap Chat and Instagram. Now I, a 44 year old SEO, and having to learn Snap Chat for our companies. I wonder if the events that happened a couple of months ago between Cambridge Analytica and Facebook has been the reason for this? That’s a hard question. I think the cambridge analytics thing did not help for sure. But, the trend of less (young) people using facebook is going on for a while longer, I think. In my own feed, I see less and less people sharing their stuff. We’ll just have to see how it goes from here. With all the data privacy issues and toxic behaviour Facebook is not a great brand and is rather embarrassing to a wider age range now. There’s plenty of other places to get Cat videos. Why should businesses want to still create content and upload for free so Facebook can leverage their advertising on? In fact their advertising platform provides diminishing returns now. They will be around for a few years yet, with their other platforms such as WhatsApp and Instagram. However, the younger generations seem to be shunning social media in general. It looks like it’s best to work hard on your website and create great meaningful content – if people want to share it they can easily do so if they want. Reach an audience by being relevant to them and connect to where they are and work out from there. We find meeting real people at shows and events is even more important now than ever before. I filled acting classes (very reasonably) with targeted Facebook ads in Chicago, but that was 9 years ago and the landscape has changed quite a bit since then. For my clients, FB has been losing importance for a couple years now. I still advise most business models to have a facebook page but we use it much differently now than we did just last year. While the target market demographic should certainly inform your Facebook strategies and tactics, I don’t ever suggest it as a primary promotional strategy anymore. Nice! Happy to hear that organic search outranks facebook. Actually Facebook deserves loosing ranks because of their stupid strategy which does not let your posts to be seen by your own fans. I understand that making money is everyone’s goal but not by selling your own audience to you on every post. I would have to say a resounding “Yes!” to the fact that Facebook is actually much less important. Perhaps not important at all. Due to the lack of integrity within the company, we’ve completely removed any linking or sharing to Facebook whatsoever. We have essentially “fired” them. We also make sure to mention in our policies that we do not endorse or support links to Facebook. Furthermore, we discourage the use of Facebook sharing by our users. I could say more, but I think that suffices. One another note, more than 90% of our traffic is generated by SEO via Google and and other search engines. Keep up the awesome work! Thanks for your input! We’ll definitely keep up the good work! IF your target crowd are the under 18’s. Boomers and Gen X’ers and older millennials are still fully engaged with the Facebook platform. It’s still relevant for advertising, however, I’d say certain verticals would perform better conversions than others. Social presence is also very important for seo. Without it, you just won’t rank competitively on relevant search engines. I think this article is pretty misleading overall. I think we actually agree. For a lot of demographics, Facebook is still the way to go. Only the youngsters are leaving. At Yoast, we still invest in Facebook as well (as we always do). But, we are also exploring other platforms, as we want to keep reaching young people as well. Totally agree with you that social presence is very important for SEO. I would agree with this – our data also shows Facebook influence is becoming less and less important in terms of website visitor numbers, including Facebook ads, however traffic volumes from Instagram (and Instagram ads) continue to rise, and lead to more conversions. I shudder and cringe when a client asks me to put a Facebook like button on their homepage. What image are you trying to convey about your company? Should a cancer medical practice have a ‘Like’ button on their homepage? Probably not. What about a Cemetery? NO. What about pizza joint? Sure. Facebook allows me to keep current and old posts alive, which encourages more people to visit my site. I also use Facebook Live for the same purpose. That’s the way I take advantage of this social media tool. Otherwise, for me, it’s a place where time is quickly wasted reading about topics that don’t benefit my lifestyle. Facebook Live is an interesting feature as well. I should write about that some time! Thanks for your input! I think this depends on what your target audience is, i agree that youngsters are moving away from Facebook and onto platforms such as Instagram and Snapchat, but Facebook still has a significant user base, even if they are getting older. As always content creators and businesses have to follow their target audience and if that means concentrating less on Facebook so be it. totally agree with you! For some audiences, Facebook is still the best way to go! I have read your post, and i agree with you. These days facebook is less using by users, hence instagram and whatsapp growing his users counts. There is big reason to get less users in active in facebook that is few of bugs. Few days back facebook had some data steal and other allegations which affected his users. And instagram is quite faster than facebook so its my suggestion that most of people using instagram and whatsapp rather than wasting time on facebook. In my opinion, one share on facebook is very important step for the seo, no matter how many people click. Facebook is important in that it allows marketers to know what is trending.